Medicine and Technology: How many physicians use social media? 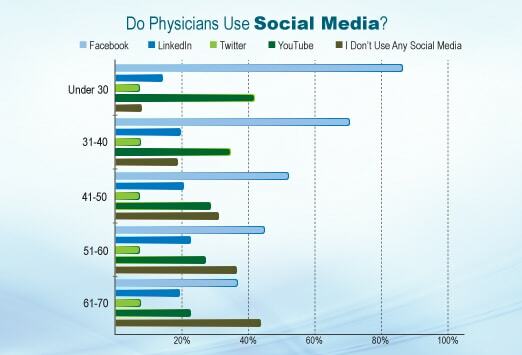 How many physicians use social media? Do Physicians Use Social Media? According to the 2012 Medscape Physician Lifestyle Report, the answer is "yes"
The use of social media drastically decreases with the age of the physician. Only about 8% of physicians under 30 do not use it, while approximately 44% of those over 61 are not engaged in any social media. Facebook is the most popular medium among all age groups, being used by over 87% in the under-30 group and by over 36% of those over 61. LinkedIn, the network that provides professional contacts and connections, is used by roughly 20% of all physicians over 31. Twitter is not widely used by many physicians but, interestingly, approximately the same percentage (around 7%) of each age group surveyed tweets and/or follows.